Throughout August, select Independent Collection hotels will air the Olympics and offer $7 drink specials. 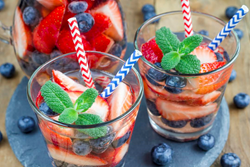 At select IC Hotels, guests and patrons are encouraged to watch the Games and take advantage of two $7 drink specials — a Caipirinha and a Red, White and Blue Sangria. “Independent Collection hotels celebrate their storied neighborhoods each day, and this year we are excited to celebrate the local athletes from not only our neighborhoods but those around the world,” said Erin Fitzharris, Independent Collection. Whether you are a sports fanatic, a global citizen or just like a good story – the Olympics provide great entertainment and a reason to celebrate. This August, to commemorate the 2016 Rio Olympics, select Independent Collection hotels (IC) are bringing a small taste of Brazil a lot closer to home by offering drink specials on Olympic-themed cocktails and airing the games in their bars. The much-anticipated Summer Games take place from August 5-21, 2016 and, around the world, viewers will tune in to root for their favorite athletes and teams competing in many Summer Olympics’ favorites, such as track and field, swimming, soccer, basketball, gymnastics and more. At select IC Hotels, guests and patrons are encouraged to watch the Games and take advantage of two $7 drink specials — a Caipirinha, Brazil’s national cocktail and a patriotic Red, White and Blue Sangria. About Independent Collection Hotels: About Independent Collection: The IC is a growing collection of cultivated lifestyle hotels located in unique residential neighborhoods of gateway cities across the US. Founded in New York, first in Tribeca and then in Brooklyn, it has grown to Philadelphia’s Midtown Village, Boston’s West End, Washington’s Capitol Hill and Dupont Circle, down to Miami’s South Beach, and west to Santa Barbara across the last five years. This distinctive hotel concept is renowned for its simple sophistication, authentic connection to local communities and personalized service. Independent Collection hotels are created for the independently minded traveler and invite guests to experience the true spirit of the city. For more information on Independent Collection, please visit http://www.independentcollection.com.